Whether here for business or leisure, most guests coming to Traverse City have some kind of itinerary in mind. They’re doing a winery tour. They’re in for a golf weekend. Or they’re simply going to “beach it” for a few days. Then, there are those whose schedule may be more flexible. 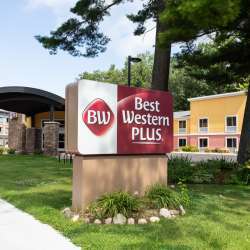 For them, Best Western is an ideal place to stay. “Our staff could almost double as tour guides,” says Ron Robinson, Director of Operations. “When guests arrive, staff members share the latest `intel’ on what’s happening in town. Even if a guest has plans, we can often offer something that will interest them...something they probably didn’t even know about. 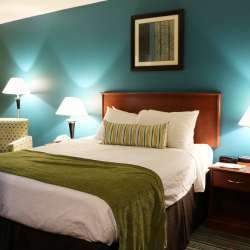 Our guests love that.” And the love shows in the positive reviews Best Western has received from TripAdvisor. The hotel was recently rated third among Traverse City hotels. The Traverse City property was also awarded the M.K. Guertin Award, Best Western’s highest honor for exemplary service. 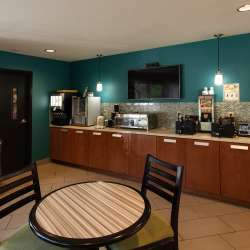 Accolades and helpful information aside, there are plenty of other reasons why guests choose Best Western. For one, there’s the pool. At 11’ deep, it’s not your average hotel kiddie pool. While you’re not encouraged to practice your double front tuck, it’s perfect for making a mega splash. Then, there’s the free shuttle. Best Western happily transports guests to and from the hotel within a five-mile radius. So whether guests want to catch a movie, go to dinner, or just hang out at the beach, they don’t have to worry about parking or driving. Helpful, knowledgeable staff. Clean, comfortable rooms. A free shuttle. A deep diving pool (sorry, board not included.) Plus, close proximity to all that Traverse City has to offer. Clearly, Best Western is among the best properties in Traverse City.